131009 23:22:40 [Warning] WSREP: Gap in state sequence. Need state transfer. 131009 23:22:42 [Note] WSREP: wsrep_notify_cmd is not defined, skipping notification. 131009 23:22:42 [Note] WSREP: Node 2 (g1.cluster.com) requested state transfer from '*any*'. Selected 1 (g2.cluster.com)(SYNCED) as donor. Note: Using LOAD DATA is not recommended in Galera. Since it is virtually synchronous per writeset, you will notice a delay in replication as the writesets undergo certification. So, expect large writesets to take time to apply. 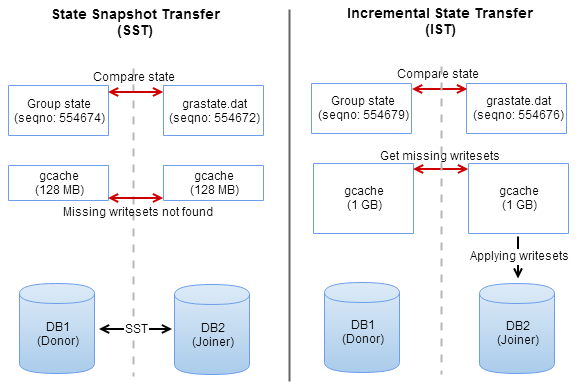 When a Galera node rejoins the cluster, it will check the local gcache to determine whether it needs to perform incremental state transfer (IST) or state snapshot transfer (SST). It will calculate the gap between group state and the local state stored in grastate.dat. If all of the writesets that it missed can be found in the donor's gcache, it will perform IST by getting the missing writesets and catch up with the group by replaying them. This is faster than SST, and non-blocking on the donor side. The gcache size defines how many writesets the donor node can serve in IST. By default, Galera creates gcache file under MySQL datadir. One might think that gcache is similar to MySQL binlog but it is not actually true, as explained in details on the Galera FAQ. IST is always the preferred choice when joining a node to a cluster. We do not want our cluster to spend time and resources on a long waiting process like SST, which can also block writes on the donor (if SST method is mysqldump or rsync). Sometime, if the writeset size grows so high that it does not fit into gcache, it will create a gcache page file (as happened in the test case). So, setting up the gcache is crucial at this state. 131009 23:45:53 [Note] WSREP: Signalling provider to continue. This blog post shows you how to calculate a good gcache size. You can estimate how long down time you can afford, while still being able to perform an IST. For example, if you have a write stream of 128MB per hour and set gcache.size to 1.3GB, then you can have a node being down for about 10 hours. When brought back into the cluster, it will be able to perform an IST and not a full sync SST. wsrep_provider_options="gcache.size = 5G; gcache.name = /another_partition/galera.cache"
Take note that Galera will pre-allocate gcache space during MySQL startup. So, make sure you have sufficient disk space before increasing the gcache size.